Purchase a cucumber, ginger root and mint leaves from wherever you get your produce. If you grow them yourself, you can just pick them up from your garden. Peel and seed the cucumber. Start with half a cuke, then decide what balance of flavors you like best by experimenting a few times. Add your cut cucumber pieces to a 2-quart pitcher. Whether you have home-grown or store-bought mint leaves, add approximately 10 leaves to the pitcher with the other ingredients; you can use fewer or more, depending on the flavor you like best. Pour water over your cut-up pieces and let stand in the refrigerator overnight to achieve maximum flavor. As you drink your fresh water beverage, keep adding water to the pieces and stir for up to two days before dumping the herbs and vegetables and starting over. 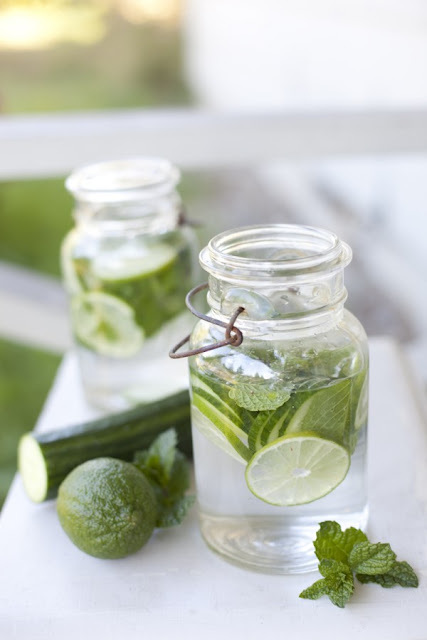 Drink as much water as you can daily; this is a refreshing option to plain old water.